^ Carlin-McCall, Kelly (November–December 2008). "The Real Bill". Irish America magazine. Retrieved April 23, 2010. So the fact that I'm half Irish and half Jewish, they both contributed to a sense of humor. ^ "Getting Blasphemous in the Presence of Bill Maher". Media.www.diamondbackonline.com. Archived from the original on 2008-12-21. Retrieved October 18, 2010. 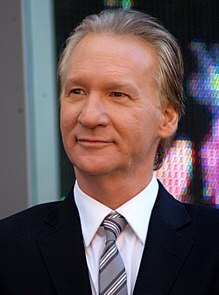 ^ a b c d e f g "Bill Maher Filmography". The New York Times. Archived from the original on 2015-06-20. ^ a b Sayre, Shay; King, Cynthia (2010). Entertainment and Society: Influences, Impacts, and Innovations (2 ed.). Taylor & Francis. ISBN 9780203882931. Retrieved 2013-04-19. ^ Prudom, Laura (30 July 2016). "'Real Time With Bill Maher' Renewed Through 2018". Variety. Retrieved August 1, 2016. 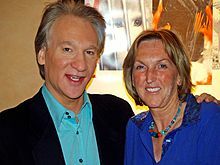 ^ "Bill Maher spends some real time with Joy". CNN. Archived from the original on 2010-10-02. ^ "Weed Time With Bill Maher". The Huffington Post. 2014-04-11. Retrieved 2015-07-01. ^ "CrazyStupidPolitics: Bill Maher Live on Yahoo! Screen". Screen.yahoo.com. 2011-04-20. Archived from the original on February 24, 2012. ^ Sasson, Eric (9 October 2014). "Yes, Bill Maher Is Boorish. But We Shouldn't Be Afraid to Criticize Islam". The New Republic. ^ "Home". WINHS, World Institute of Natural Health Sciences. Retrieved 2012-02-24. ^ Gorski, David. "Bill Maher gets the Richard Dawkins Award? That's like Jenny McCarthy getting an award for public health". ScienceBlogs. Retrieved 2013-03-20. ^ Gardner, Martin. 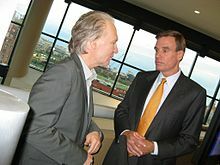 "Bill Maher: Crank and Comic". CSICOP. Retrieved 2013-03-20. ^ Novella, Steven (September 23, 2009). Podcast 218. The Skeptics' Guide to the Universe. Archived from the original on December 10, 2012. Retrieved 2013-03-20. ^ Swiss, Jamy Ian. "Overlapping Magisteria". JREF. Retrieved 2013-03-20. ^ Lehner, Marla (2004-11-29). "Bill Maher: Ex-Girlfriend Is a Con Artist - Bill Maher". People. Retrieved 2015-07-01.